Workshop Calendar and Registration - Sign up Today! Whether you're a budding artist/crafter or haven't created anything since kindergarten, we will inspire you and help you unleash your creativity! Our workshops are designed for you to have fun and walk away with your very own work of art - no mistakes, no rules, no judgement! Learn how to create a whimsical paper confetti bowl, sure to be a conversation piece in your home! So sweet! This card is sure to uplift the spirit of the recipient! You will leave class with 2 of these lovely greeting cards perfect for a birthday, Mother's Day or just because. Mandalas have been used for centuries as a meditation tool to engage the creative hemisphere of the brain, encouraging it to run free while quieting the analytical part of the brain, encouraging it to rest. Painting, coloring or drawing mandalas invites the creative brain to come out and play, leading to a relaxed state where we can hear the quiet whispers of our heart. In this workshop you will create a mandala using a variety of mixed media collage techniques. Your mandala can be used as a beautiful piece of art or as a meditation tool to quiet your mind and hear the whispers of your heart. *The collage pictured is for inspiration only, the collage you create will be your very own unique design. The peacock is a symbol of integrity and the beauty we can achieve when we endeavor to show our true colors. In history, myth, legend and lore, the peacock symbolism carries portents of: Nobility, Holiness, Guidance, Protection and Watchfulness. 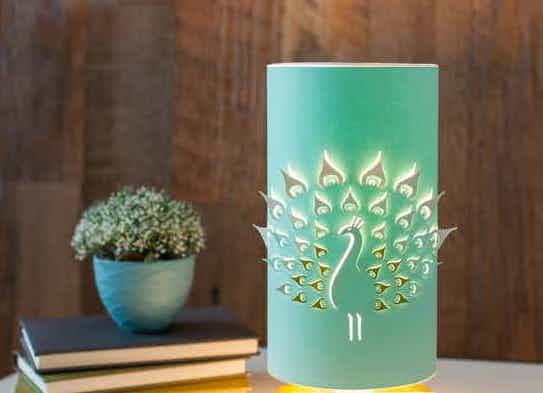 Create your own lovely Peacock luminary constructed of paper and embellished with your choice of paint, sequins and rhinestones. Place your work of art over a battery operated tea light candle for a beautiful accent to any room as well as a reminder of your beauty and integrity. Inside our hearts exists a collection of affirmations - small whispers nudging us to dream bigger, take risks and trust our creative spirit. 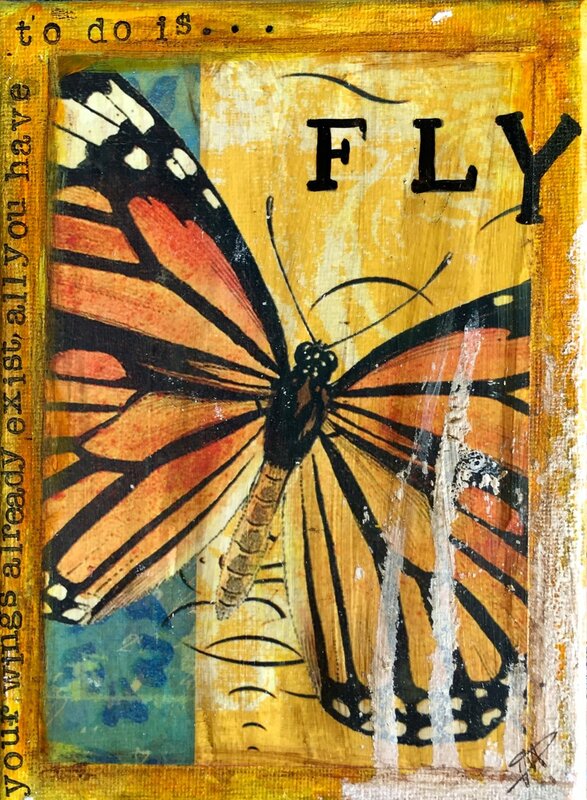 In this workshop you will learn a step by step process for creating an affirmation collage using layers of paper, paints, stencils and stamps. You will also learn a variety of texturing techniques to add interest and dimension to your project. You will leave with a work of art that reflects your heart's whispers and nudges and a reminder of your personal affirmation. There is nothing like flowers to brighten your day! Learn how to make a beautiful paper rose, gerbera daisy and carnation - it's much easier than you think! These flowers can be used in a paper flower bouquet or as an embellishment on a card, gift wrapping, barrette, pin, headband, magnet, picture frame, lamp shade, the possibilities are endless! 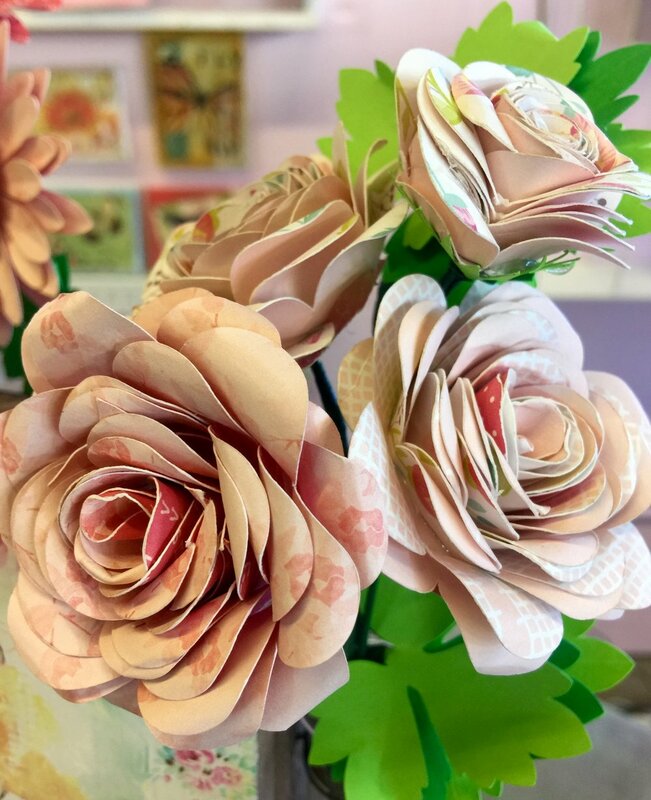 In this workshop you will make your very own quilling tool to take home as well as 1 rose, 1 gerbera daisy and 1 carnation. Weddings and roses go hand in hand. If you are planning a DIY wedding this is a must workshop for you! I will show you how to make giant paper roses that are sure to be the highlight of your wedding decor. Create a show-stopping photo booth backdrop, make a single giant rose centerpiece, have your flower girls carry a single giant bloom, use them to decorate the alter, there are so many ways these blooms can be incorporated into a wedding or special event. You will create 1 giant rose at this workshops to take home and enjoy. Make a special mixed media collage for your sweetheart for Valentine's Day. Nothing says I love you more than a personalized work of art that can be enjoyed year-round. This free style class offers all the goodies you need to get creative and make your very own 2018 Valentine's Day keepsake. This "exploding" treasure box is as much fun to make as it is to give! Remove the top from the lovely box and watch as it "explodes" open into twelve 2-sided paper flaps that can be adorned with anything that inspires you. Use it as a gift box, scrapbook, collage box, vision board or keepsake box. Fill it with photos, quotes, drawings, magazine pictures, a small gift... the possibilities are endless! You will create and embellish an "exploding" box and learn how to make a paper flower to attach to the top. Viola! A heartwarming and memorable treasure box sure to be cherished for years to come. Learn all the basic skills needed to make a beautiful personalized mixed media collage! You will learn a multi-layer process using paint, paper, stencils and rubber stamps. You will need to bring 2-4 photos from a magazine that will be incorporated into your collage project. You will create a beautiful one of a kind work of art! It's time to create a life you love living! Join our vision board workshop for an afternoon of getting grounded and focused as you identify what you what to do, be and have in 2018. After a few exercises to help you get clear, you will create a portable accordion style foldable vision board to aid in bringing your vision into reality. Don't drift aimlessly through another year! Decide what you want, put images and words to it, and move in the direction of your dreams! The Unfolding Your Life accordion style vision board will be a personal, portable work of art and a visual affirmation of your values, goals and dreams. Come join "The Kindness Rocks Project" and spread hope and joy by painting a Meaning-Full Rock to add to our community rock garden or to take home and enjoy!